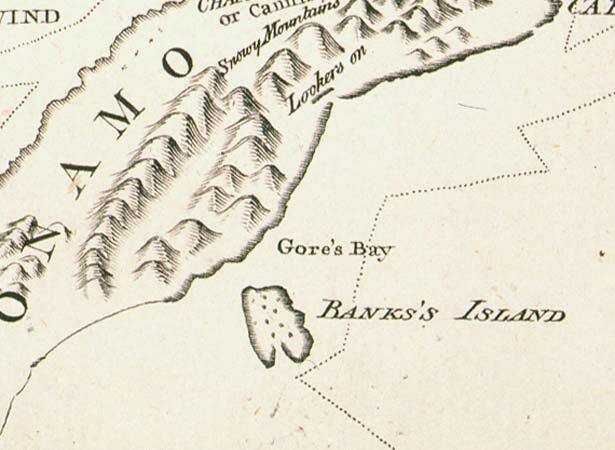 Cook concluded that the land he had sighted was an island and named it after the expedition’s botanist, Joseph Banks. The mistake was not realised until 1809, when Captain Samuel Chase of the Pegasus tried to sail between Banks ‘Island’ and the Canterbury mainland. This was one of only two significant errors on the remarkably accurate map of New Zealand Cook made on his first expedition. He was too far from shore to see the low-lying land joining the volcanic peninsula to the mainland. He also made the South Island too narrow because he did not realise how far east the Canterbury Plains extended. But the outline of the South Island is clearly recognisable, and he correctly recorded the main mountains. The Yorkshireman even recorded a Māori name for the South Island, Te Wai Pounamu (as ‘Toai Poonamoo’). Cook’s achievements in charting the South Island were all the more remarkable, given that prevailing winds consistently kept the Endeavour well offshore. Without a chronometer he also struggled to determine his exact longitude. Cook’s second major error was recording Stewart Island as a possible peninsula. To be fair, he thought there was probably a passage between what he mapped as two bays, but he left the chart incomplete. The first chart of what was to become known as Foveaux Strait was produced by American sealer Owen Folger Smith in 1804. We have 5 biographies, 2 articles, related to James Cook sights Banks 'Island'.